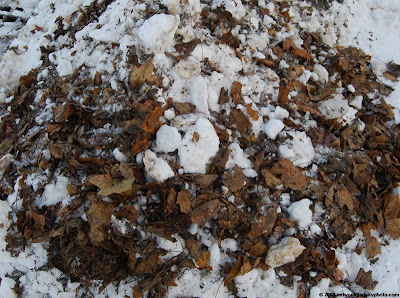 Despite our best efforts and those of our neighbors, the leaves that had been put out for pickup by the city were not removed prior to Sunday's snow. After I got home last night, I spent a half hour doing cleanup of the sidewalks and pad next to our garage, and was generally happy with the way things looked. Less than 15 minutes later, the plow came by, and delivered two 4 x 8 foot sheets of plywood and a pile of leaves big enough for a couple small children to play in. It made for quite an interesting mess.